It won’t be soon until I can stop buying those expensive bags of Rocket leaves, which supermarkets seem to pollute with Watercress. I don’t particularly dislike Watercress, but it seems that any bagged salad that contains Watercress is like buying a tasty crop of green leaves, with a special handful of slimy, rotting waste thrown in. It almost feels like your bag of salad has become Baby Bio by the time you get it home. The Rocket ‘Skyrocket’ seeds that I sowed in the Unwins salad kit, germinated within 4 days of sowing, and the seedlings are now more than an inch high. 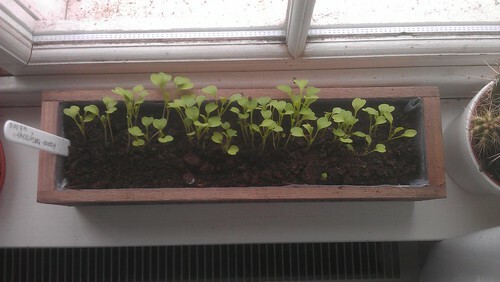 The Rocket ‘Skyrocket’ seedlings are growing fast. Meanwhile, the seeds for the Parsley ‘Moss Curled’ and Chives (from the other Christmas gift) are happily growing on the next windowsill along. These will need pricking out soon. I’ll have more than enough of these plants. 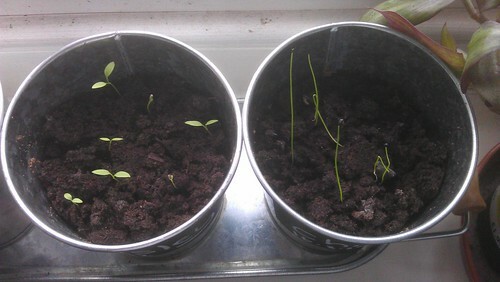 Parsley ‘Moss Curled’ (left) and Chives (right) have germinated in their BBC Gardeners’ World growing kit. Last year’s Salvia ‘Nemerosa Ostfriesland’ has continued to thrive in its pot, so this afternoon i took some of the top soil out and replaced it with some fresh compost. I’m really pleased that this survived the harsh winter, as it was last seen completely covered in snow alongside some bright blue/indigo Polyanthuses that sadly didn’t survive. When the Salvia flowers, I hope that it will once again attract the bees into the garden. 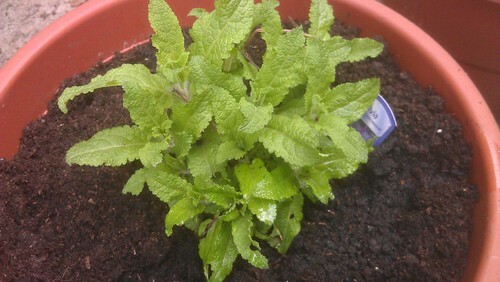 The Salvia ‘Nemerosa Ostfriesland’ survived the harsh winter and is lush with growth for 2012. My second wave of 2012 Salvia ‘Farinacea Victoria’ seed sowings seems to be more successful. I’d previously managed to prick out the paltry four seedlings from my January sowing into some 3″ pots to grow on, and now my sowing from a couple of weeks ago is beginning to see the lush green leaves poking through the compost. I managed to spend some time in the garden lightly digging and removing some of the weeds that had managed to take hold. These weeds will easily take hold at this time of year, so it’s important to remove them now. I discovered that a Sweet Pea ‘Cupani’ has self-sown and a small but healthy plant is merrily growing halfway along a border. The Nepeta ‘Six Hills Giant’ has self-sown – again, another flowering plant popular with bees. Sadly, my Rosemary Upright ‘Rosemary Officinalis‘ (which I often use in cooking as it grows fast and is very aromatic) was unable to survive the hard winter in its pot, so I’ll aim to replace this soon.